Oh, wow! What a fun weekend! Mimosas were sipped. Thrifting was done and a whole lot of laughing happened too. Alix and I surprised the Dames with a grand giftie from Snapfish. But we’ll chat about that later this week. Thrifting in the wild made me even more excited about getting on line and finding some goodies to share with you. Whoa! A pristine set of Lincoln Logs! Yes, please! Still so much fun. From Etsy seller, 1 Sweet Dream Vintage. Whoa! Check out this sweet vintage striped coat. In a big girl size 12. What a treat! From Etsy seller, Ms. Tips. Who doesn’t want good things to eat? In game form? OK! From Etsy seller, Sweet Shop Vintage. I have such a weakness of Irmi and this sweet Jack and Jill light plate is in great shape! From Etsy seller, Toadstool Vintage. I know caps are very popular with boys right now, so a sweet vintage mod cap like this one, I’m sure won’t last long! From Etsy seller, Stop the Clock Vintage. I would have fought to the death with my cousins to drink from this glorious Betty and Veronica jelly jar glass when I was a kid! Loving the fringe bag, Veronica is rocking. From Etsy seller, Twinkletots Vintage. My apologies, but I have such a weakness for these great vintage poly tops with the image accent. This sailboat one is just dreamy! From Etsy seller, Bird Avenue Vintage. Would you look at that chubby little pink birdie on this shirt? Just insane in the membrane cuteness! From Etsy seller, Miss Peanut + Little Peanut Vintage. What little kiddo wouldn’t warm up to this vintage Fisher Price sunshine yellow tea set? From Etsy seller, Toys of the Past. I remember some of those. I was a tinker toy girl myself. OMG. I so wish I had seen that tea set before buying Eliza hers! (OK, her tea set AND her kitchen set.) So adorable! And my fingers are itchin’ to buy that little birdy shirty, pink or no! I know–that shirt is pure stinktown, but I’m guessing you’ll be staving off the vintage buys until you are back East and have room to buy more stuff. Yay! I have that betty and veronica glass and you can have a little sippy out of it next time you come over! That sailboat shirt is so sweet! I love it! 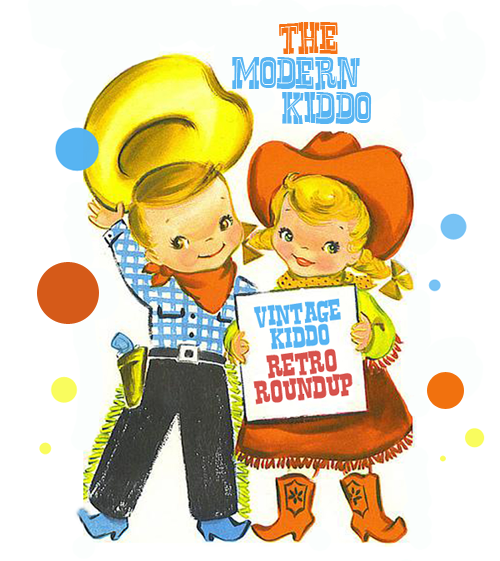 All that vintage loveliness! Lincoln Logs!! Who doesn’t love ’em? And that Cap! Totally adorable.